Facebook’s news feeds, launched last year to a lot of controversy, has proven to be a brilliant move. It gives users a constant stream of data on what their friends are up to, and help spread new memes through Facebook at a lightning quick pace. But all that information was stuck in Facebook and there was no way to access it other than logging in and looking at your home page. Now, though, Facebook is starting to turn those news feeds into RSS feeds. Available feeds include status updates for your friends, posted items for friends, and notifications for any user. This allows Facebook users (or anyone really) to keep track of what’s going on with their friends without actually visiting the site. Facebook hasn’t made any announcements on this yet, so we don’t know what else is coming. But embracing RSS is sure to win them a lot of friends who’ve been wondering if Facebook is just another closed silo of data. Winer looks to be the first. The latest “shiny social object”: an open/controllable social network? Well, I’ve been taking a lot of shots in the past few weeks for always covering the latest shiny social object. You know, first it was Twitter. Then Jaiku. Then Facebook. Pownce. On and on. The critics say that either I’m late to the game, like with Facebook, or that I’m just too scattered and not looking for real value. Or that I don’t stay on one thing long enough to learn it well and add real value to my writings. Fair enough. Although one thing I’d like to clear up. When I yammer on endlessly about Facebook that doesn’t mean I’ve stopped using any of the others. Twitter, for instance, is just a constant part of my life now. Anyway, last night I was at the Facebook party aka “Lunch 2.0.” I met Mark Zuckerberg and his sister, Randi, and a ton of Facebook employees and executives. It is one of those parties that in about five years we’ll all be looking back on as a major inflection point in the valley. I stayed until the very end. In fact, even after the party ended a small group of us hang outside of Facebook’s offices and kept talking about what is going to happen in social networking. One of the guys was John McCrea, vice president of marketing for Plaxo. But then he explained why we should care: Plaxo is going to open up a new social network that’s both open as well as controllable. Translation: Plaxo is making a play for Facebook. First, let’s go back to Facebook. Why does everyone say it’s a “walled garden?” Because you can’t get to data stored on Facebook unless you’re a Facebook member. Two days ago I did a video for Chris Pirillo on Facebook. Chris instantly got excited and wanted to share that with his blog’s readers. But he couldn’t. That video is locked inside Facebook’s walled garden. If you don’t have a key (a Facebook account) you can’t see it. John told me that on Monday Plaxo will come out with a social network that gets rid of the walled garden. Why did I say a couple of weeks ago that Facebook is a “data roach motel?” Because I can put all sorts of information about myself into Facebook (I could, for instance, tell you that I like “Daft Punk.” But, do I own that data? Can I get it out of Facebook? No). John told me that on Monday Plaxo will come out with a social network that lets me own my own data and take it out of Plaxo and put it on other social networks. Finally, I’ve been getting a few complaints about what I’ve been doing with Facebook. By turning Facebook into a professional networking tool I’m causing problems for people who saw it as a social tool to keep in touch with their college friends. See, Facebook for the first three years of its existence was mostly a tool for college kids to pass photos and other funny things around. Now, if you have photos of your frat party at college do you really want your new boss and coworkers to see those? Probably not. But Facebook isn’t controllable. You can’t really have two groups of friends. One group that sees your drunken college frat photos and another group that sees you making presentations to your board of directors. John told me that on Monday Plaxo will come out with a social network that lets me control which groups of friends (or family) that can see certain items. OK, sounds like Plaxo is going to kill Facebook and bring down Facebook’s value by a few billion dollars. The bubble 2.0 will end. Zuckerberg will drag his tail away from the valley defeated. Etc etc etc. Right? It’s not going to happen. Here’s why. It’s too late and the walled garden will keep people locked in. 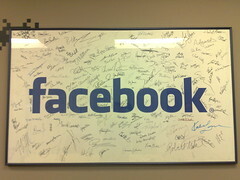 Sorry, Facebook already has momentum and a coolness about it that Plaxo doesn’t exude. I don’t really know how to explain the coolness without sounding really idiotic and goofy. That’s part of the 20-something vibe that Facebook has going for it right now. Oh, here’s a photo of me looking at the artwork in the Facebook offices. That might explain a little bit about it. There’s lots of other photos from the event last night here. But it’s there and can’t be ignored. If John could explain to me how he’s going to get the world’s college students to look away from Facebook and toward something else maybe I’d go along with this “more open and controllable” Plaxo. My head is telling me that Plaxo is the way to go but my emotion tells me that Facebook is more fun. The other thing is that BECAUSE of Facebook’s “closed” nature I’m not likely to leave it anytime soon. Why? Because if Facebook has 10% more content than the other networks do (which it will have because of the momentum that Facebook has today) that the more “open” networks will always seem lame in comparison. But, on Monday I’ll try out the new Plaxo. I’m into “shiny social objects” and will report to you the pros and the cons. The problem, though, is that even if I get really excited about it my email is demonstrating that many of the world won’t be listening and won’t care. After I get up this morning I’ll film a video explaining more of my thoughts and I’ll put that on my Kyte channel. For now Nokia’s CTO left me a little message there. I’ll do more stuff from the Always On conference today. 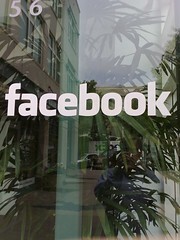 OK, the TechCrunch interns tell us about their top 10 favorite Facebook applications. Now, since the interns are 20-somethings I expected that I’d have a different take on what we needed and so I talked through it on my Kyte.tv channel. 2. Graffiti (way to draw little lame cartoons on your Facebook profile). 3. Where I’ve Been (a way to brag to your friends that you’ve been to more countries than they have). 4. Zoho Online Office (a way to share Zoho’s apps with your friends). 5. Fantasy Stock Exchange (fun game, I wonder which stocks they are picking). 8. Box.net files. Useful way to share files. 9. Superpoke. A serious 40 something wouldn’t be caught dead pinching, hugging, tickling his friends. 10. Friend match. 40 somethings don’t need more friends. 1. Google Reader Shared Items. This is way more useful for those who read a lot of feeds. Plus it shows you who has the most popular blog posts in the past few hours. 2. Twitter/Pownce/Jaiku apps. Pick the one you’re on. That lets your Facebook readers keep up with you, no matter where you post. 3. The video application. Lets you send video messages to all your friends from your computer’s webcam. 4. Kyte.tv. You see it here on this post (if you’re reading on my blog — lots of feed readers strip it out). But you also see the same thing on Facebook. You can chat with people live there on that app too. 5. BlogTips. If you’re looking to blog better, use this app. 6. Upcoming Calendar app. Come on, don’t 20-somethings have to keep track of all the events that are coming their way? 7. Blog Friends. Don’t the interns have any friends with blogs? This is how you track them. 8. Wordpress. If you blog on Wordpress or Wordpress.com, this is the app for you. Shows your posts AND your comments. I thought every 20-something had a Wordpress blog? 9. Ustream.tv. This isn’t important to everyone (who here other than Chris Pirillo has a streaming video show). But I included it here cause I have to wonder about a 20 something who isn’t into streaming video. Don’t you guys watch Justin.tv? 10. SkypeMe. Lets you use Skype to call me. 11. FaceReviews. It’s a Website that reviews Facebook applications. 12. iLike. Hey, at least we matched up on that one and the Zoho one (although I don’t have any Zoho stuff I want to share publicly yet). What do you think? Which Facebook apps are you using, if you’re on Facebook? I don’t add any of the silly ones, so don’t tell me about the Ninja app or anything like that. I met with a few people who work at Facebook today (my first meetings). 1. Facebook’s first office was above Jing Jing in downtown Palo Alto, which Dave Winer made famous for Spicy Noodles. Of course we ate there and had Spicy Noodles. 3. They are seeing a lot of growth. Both in usage, as well as employees. If you’re a hot computer scientist they are hiring. 4. They are continuing to move to a wider demographic than just college students, which should have been obvious to anyone who is following their moves over the past year. I told them that I have already seen that, most of my 3856 friends aren’t in college anymore. They are also taking over quite a few buildings in downtown Palo Alto near the Stanford University Campus (more than three buildings already, with more needed). 5. There is a limit to the number of friends you can have: 5,000. This is there because of technical limitations. After you reach 5,000 you have to remove someone before you can add someone else as a friend. 6. People with thousands of friends are called “whales” by Facebook employees. Only a small percentage of their user base has more than 1,000 friends. 7. They expect many more “useful” apps in the next few months. Apps aimed at just getting spread around (one I don’t accept is the Ninja app) are probably not going to be as successful as a new wave of apps that actually provide some value come on board (my favorite example there is the Google Shared Items App). 8. For employees who live within a mile of Facebook’s headquarters they subsidize your housing. Translation: if you hang around in Palo Alto chances are pretty high that you’ll meet someone who works at Facebook. 10. The leadership at Facebook is young. I knew that since I remember listening to Chris Putnam’s music when he was 16 (he’s now one of Facebook’s best developers — his team built the video app, which is really awesome — and he just turned 21). Anyway, I’ve come away even more impressed with the team here. This is definitely the most interesting company that I’ve met in the past few years and can’t wait to bring you more news from inside Facebook. UPDATE: Some people are misunderstanding me here. The update will let users add new datatypes to their messages on Facebook walls. It doesn’t mean that apps will be able to write their own messages to walls.